For some reason, my husband's co-workers are always fascinated by what he eats when he goes on his supper break. It must be because he's usually the only man on that break and he, rather unusually for a guy I guess, just eats salads or fruits, the women are forever curious as to what he's having. Could the fact that they're mostly older than him have a bearing on that? 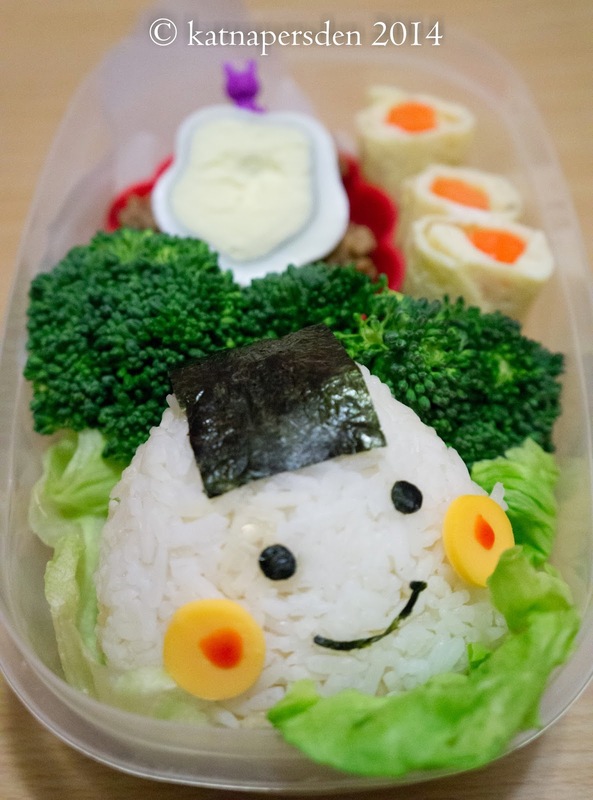 I always wondered what they're reaction would be if I packed him a cute bento... so I did. I made some onigiri and packed him some of the leftover sauteed minced pork together with half a boiled egg, tamagoyaki, lettuce and steamed veggies. Below is some of the equipment I used. My sister in law asked me how I make these bentos and so I thought I'd do just that. I should do pictures but I wasn't able to with this one so I'll just write out the instructions. It's fairly easy. For the onigiri, I just took about a 3/4 to a cup of rice, wrapped it in some cling wrap squished and shaped it into a triangle. There's dozens of recipes on the net on how to make different types of onigiri. I just used plain rice on this one. Once I finished shaping it, I removed the cling wrap set it aside and made the face. For the eyes, I took some nori and used a bento face punch and just used the circles it made. I also used the mouth on another face punch for my onigiri's own mouth. If you don't have a bento face punch, you can always cut out the shapes yourself. For the 'hair' I just cut a rectangle shape from nori that's roughly the height of the onigiri plus about an inch more so it can go over the top of the onigiri and form 'bangs'. You don't need to be accurate as you can adjust it it looks just right. 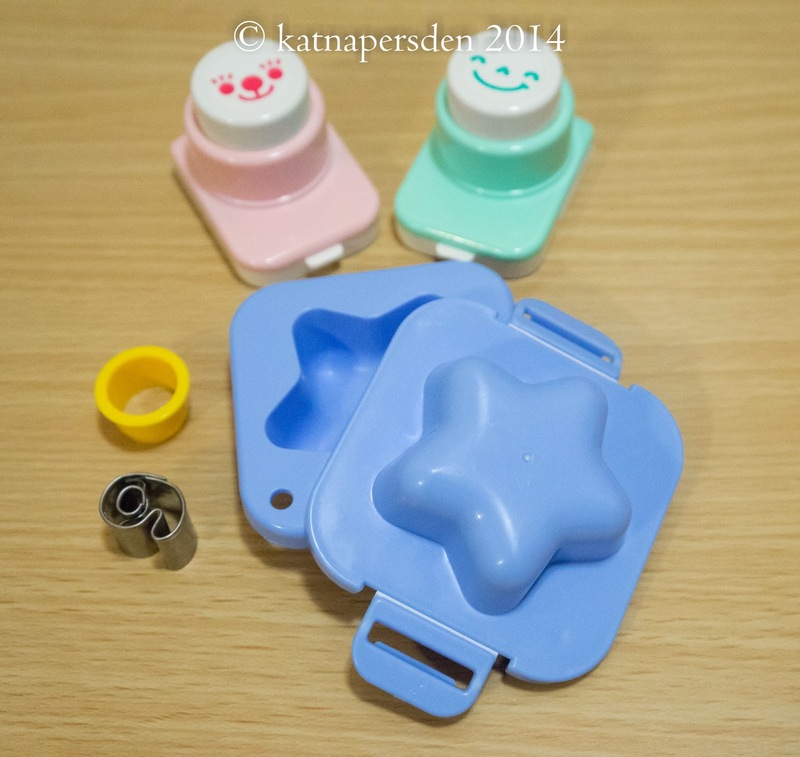 I then used the cookie cutter to cut out circles from cheese to form the onigiri's cheeks. When I finished putting them all together to form the face, I just dabbed some catsup on the cheeks to give him a 'blush' and he was done. If you want to make the star shaped egg, there's lots of tutorials on the net on how to use an egg mold. I'll try to post one when I can but Google might be quicker. You can buy egg molds from eBay, Amazon, or BentoUSA.